What's that? 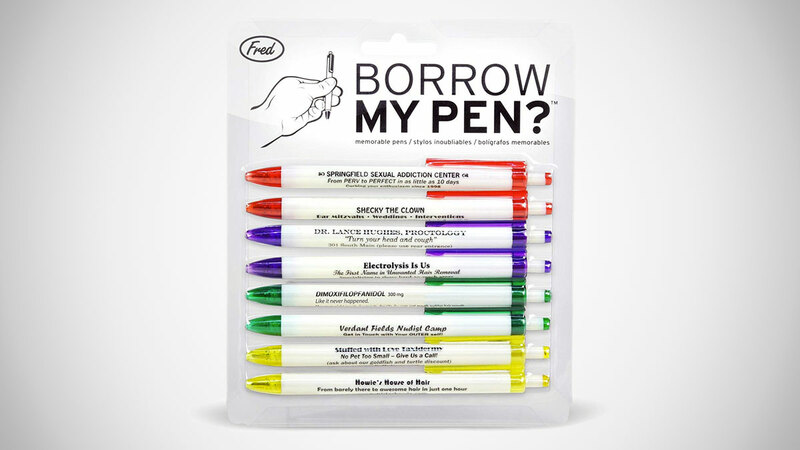 Can you borrow my pen? You too? You need one? And you? Well. I don't usually do this, but I'm feeling very Oprah today, so...here you go. You get a pen, and you get a pen, and you get a pen, and...oh, I know you'll give it right back to me. Your word is your bond. And the pen I gave you says it came the Springfield Sexual Addiction Center. Fred & Friends Subversive Pen Set comes with 8 unforgettable ballpoints advertising goods and services no one will ever want associated with them. So, presumably, when you lend your co-worker a pen that says Verdant Fields Nudist Camp across the barrel, he won't make off with it like Putin with Robert Kraft's Super Bowl ring. Or maybe he will. Either way you win. The Borrow My Pen Subversive Pen Set is a pretty tame gag or novelty gift, rated PG rather than R like the Offencils profanity pencils. It's almost a shame too. They could have had a lot more fun promoting vaginal creams and colonics, drag queen dominatrices and baby muzzles.